A warm welcome from the Wow It Love It Have It team! Today, I will share with you some handy dandy tips and tricks to allow you to make the most of your B2B marketing campaigns. I will also give you a crash course in email marketing, telesales and direct marketing. 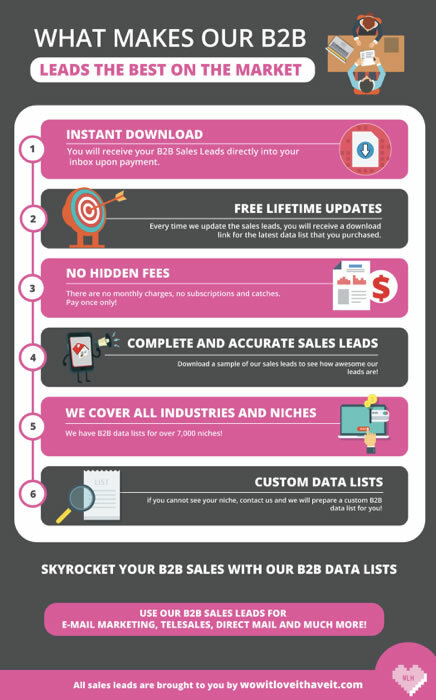 Before we get into the nitty gritty, let me just give you a quick overview of our B2B sales leads. The awesome data processing team at Wow It Love It Have It has created B2B sales leads for virtually every industry in most countries including the United States, UK, Canada, Australia, Russia and many more. To find B2B data lists for your niche, I recommend that you run a quick search in the search bar. 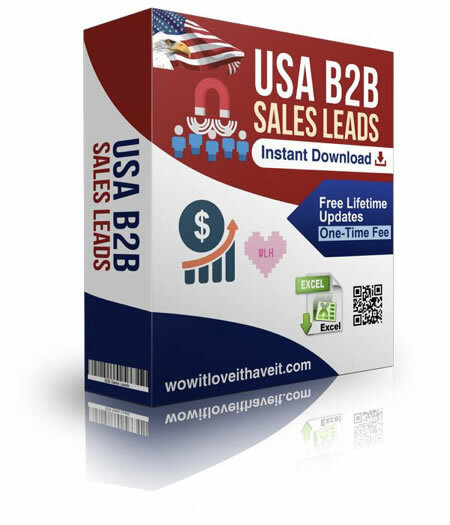 This is by far the quickest way of finding sales leads for your industry. Alternatively, you can also browse through the collections, but this will be slightly slower as you will have to comb through a lot of data lists. If for any reason you cannot find your niche, please contact us and our data processing team will create a bespoke data list for your industry. If you have found a data list for your niche, you can scan through the data breakdown and download a sample of the data list to get an idea! The sample data list is an extract of the first 100 records inside the full data list. I also recommend that you watch the cool explainer video to get an idea of the key features of data lists. Once you have placed your order, you will receive a download link to your sales leads directly into your inbox! If you have not received it within 10 minutes of placing an order, please ensure that you check your spam folders. You can use our sales leads for many different types of marketing, including newsletters, email campaigns, direct marketing, telesales and much more! With that out of the way, let’s turn to the moment you have been waiting for. Let me share some useful tips to make the most out of your B2B leads. MUST WATCH: THIS VIDEO WILL CHANGE THE WAY YOU DO B2B EMAIL MARKETING! Let’s firstly turn to e-mail marketing. Email marketing deserves the most consideration because it can be an area that is difficult to crack. There are many strategies to consider on how to stand out from the competition! I want you to open your business inbox and go through your inbox and spam folders. I bet you can see emails such as “introducing a new product”, “sale 20% off”! It is a common denominator that many unsuccessful marketing emails share. They are all too predictable, boring and spammy! Now, tell me honestly, how many promotional emails have you opened? The rest of this tutorial will focus on how not to be one of the spammy emails you have just gone through in your inbox! If you want to use the leads for e-mail marketing, I strongly recommend that you check whether your IP is blacklisted on any websites. You can run a quick check by going to mxtoolbox.com. If your IP is blacklisted on any spam websites, this can reduce your delivery rate. Some blacklisting companies allow you to file a request to remove your IP or website from their spam list whilst others remove your IP or website automatically if you do not send any emails for a period of time. If you are sending many newsletters or emails from the same account, it is only natural that your website or IP address will be on a spam list. It happens to the best of us. If you are using an e-mail marketing software, you can purchase either use the SMTP server of your e-mail provider or you can purchase an SMTP address from external service providers. One thing to note is that if you intend to send extremely large amounts of e-mails or newsletters, setting up your own SMTP server may be significantly cheaper than going with a newsletter provider because newsletter providers such as Mailchimp will charge you a fixed price for any given number of emails. There are many external services and even freelancers who can set up your own SMTP server with a daily sending limit of around 200,000 e-mails for as little as £150. Such SMTP servers also have the added benefit of IP address rotation which can help you to increase your delivery rate! One last technical thing to bear in mind is that it is recommended that you break down your email list into smaller packets and send them individually. This will help you to avoid spam blacklists and achieve a good inbox rate. Now that we have cleared up the technical stuff, let’s move to the meat and bones of your e-mail marketing. When drafting your email or newsletter, ensure that you do not include too many keywords that will trigger the spam filters of email service providers. There are some external services that offer you to check the SPAM score of your email or newsletter. You can find them by running a simple Google search. When drafting your email, it is important to ensure that you are not too pushy or salesy as that can scare your potential B2B customers away. Instead, try to be friendly, informative, personal and helpful. If your potential clients find your e-mail helpful, they will be more likely to buy your products or services! I am now going to share a small secret with you. When you download your B2B data list, sort the emails by country or region and save each email list according to that region. It will allow you to schedule your email or newsletter campaigns according to time zones. The benefit of this is that your emails or newsletters will reach your recipients at the right time which means that your message is more likely to be read! If you send your email or newsletter at night, then there is a chance that your email will be buried in a large pile of other emails and is more likely to be overlooked and never opened! Do not rush to blast your emails or newsletters. Instead, think them through, review and schedule them. You want to project a professional and spam-free image of your company. And above all, you do not want to develop a negative reputation! The next step is to ensure that you are compliant with your local laws. If you are based in Europe or will be doing business with businesses in Europe, it is important that you read up on General Data Protection Regulation. Non-compliance with spam laws, can land your business into serious trouble and can have severe financial consequences. Direct marketing spans mail marketing and visits to each business. Direct marketing can be more expensive and time-consuming but it can be more rewarding in the long run. With direct marketing, you have the opportunity to establish a close and personal relationship with your potential clients which is likely to build their trust and separate you from your competitors. You may find it useful to send useful brochures, samples of your products and other promotional materials to your B2B prospects. This is a less-intrusive and rather effective way of gaining business. However, it may be cheaper and more efficient to conduct an e-mail campaign first to filter out the businesses that are not interested in your services or products. Nowadays, you can order a lot of business cards, brochures, fliers and other promotional materials from many printing websites that offer very good prices due to their economies of scale. For example, I have come across an e-liquid company that sent out their e-liquid samples to many vape shops in the UK and as a result got many orders simply because the customers of vape shops liked their e-liquid. THE NEXT MARKETING CHANNEL TO CONSIDER IS TELESALES. Cold calling may have a stigma attached to it which many people would instantly associate with PPI and car accident calls. However, concise and friendly calls can land you business as a direct call is the best way of speaking to a real human being. It is your golden chance to establish a personal rapport that can lead to follow up emails and even meetings. People like to know that there is a human behind any business or website. Telesales may appear to be an expensive way to market your business, but that is a myth! Skype offers unlimited calls to mobiles and landlines across the world for as low as £5 a month. There are tonnes of great freelance websites where you could find a full-time telesales freelancer for as low as $500 a month. LAST BUT NOT LEAST, LET’S EXPLORE HOW YOU COULD USE BUSINESS WEBSITE ADDRESSES FOR YOUR MARKETING CAMPAIGNS. Websites are very useful in the sense that they have contact forms and social media links. You can access each social media channel such as Facebook and contact businesses directly. Businesses respond extremely well on Facebook and it is a great way of avoiding the spam folders associated with email marketing. Contact forms are also extremely helpful in the sense that they more or less guarantee the delivery of your message to website owners! Yes, submitting contact forms manually can be quite a cumbersome endeavour. Our team has invented two great pieces of lead generation software built for ecommerce platforms that are using Wix and Shopify. These contact form submission software will allow you to find all websites related to your niche using your keywords. Now most marketers are adverse to software and automatically label them as spam! WRONG! What makes most software spammy is how people use them. By targeting your list of websites, there is nothing spammy about automating an activity that you would do manually in the first place! However, let us not digress. Do check out the Crazy Pants and Mop Mop’s lead generation software on our website for more information. To tie things up, remember that marketing is all about identifying a problem and providing a solution! Business customers do not want to buy a service or a product if they do not need them. Regardless of what marketing channels you are using, always identify the problem and give a solution! The solution to the problem will sell itself without you having to do any hard selling! I really hope that you have found this crash course in marketing useful. It is not meant to be definitive and I always encourage independent research. I have tried to cover the most salient and relevant aspects that are typically encountered by marketers around the world. Don’t forget to subscribe to the Wow It Love It Have It newsletter and YouTube channel for more tutorials, tips and guides to skyrocket your next B2B marketing campaign. Have a great day! Bye!